When creating wedding invitations in Spanish you can quickly make an elegant and beautiful design. A myriad of options are available should you choose to follow Spanish cultural themes and design elements. The text can simply be transferred from one design to the other by using a stylized font to match the design so it is best to decide what you want to write beforehand. Once the text is finalized you can work on selecting a design for wedding invitations in Spanish. It’s worth considering the kind of paper you will utilize for the card. Why not try a beautiful marble effect paper in ecru? You can just use a short deckled edge for the front panel with an embossed and die-cut gold heart which opens to reveal the names of the bride and groom on the second panel. The entire invitation should be printed on the inside. Why not create matching envelope seals and reception cards with the same theme? You can even make address labels and ribbons using the same color to coordinate with your wedding invitation in Spanish. If you love flowers then perhaps you can incorporate roses or a bouquet on the top of the card. A good idea is to have them die cut and embossed on the edges in pure gold. By using the method of thermography printing you can create pearlized floral designs in light pink or lilac. Or choose doves with flower bouquets and ribbons printed for a unique design. For a dramatic and elegant design why not use a black jacket cover which also functions as a pocket for the invitation? 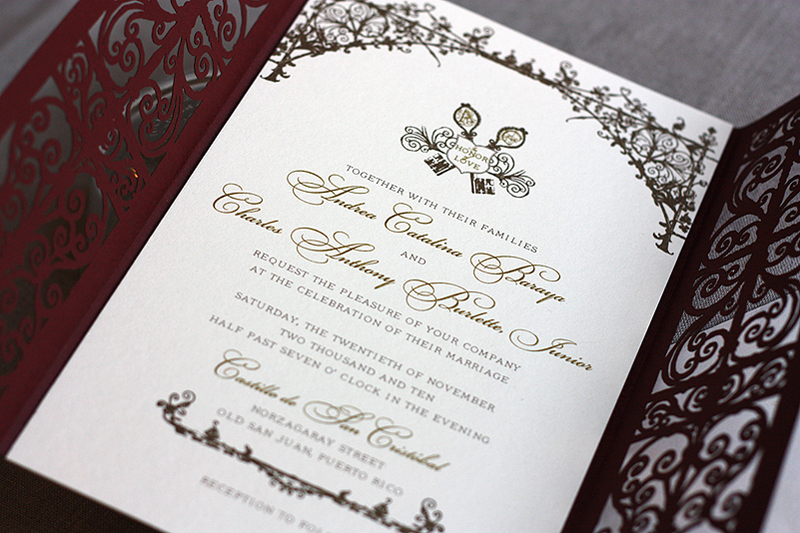 A contrasting red card and invitation can be printed to achieve an elegant contrast. As the card is pulled out of the pocket you can have your initials printed on top as a monogram by using the thermography printing method. Any stylized font can be chosen for the monogram and the wedding invitation in Spanish can be printed inside in black text on contrasting red paper. By replicating the trail of the bride’s dress on top of the wedding invitation in Spanish you can create a rose trail on the card. The images on the top of the invitation card will display the back of the groom and the bride’s dress which trails down to the edge of the card. This finishes with burgundy roses at the base which look like the border of the card. You can opt for a great shimmering heart with a green background and decorated accents. The red heart which is printed with thermography will contain the names of the bride and groom. The images of a bride and groom right on top can be accented with a silver border and the card is finished off with black swirls embellishing the bottom for a classy and romantic wedding card.